These semi-jacketed hollowpoint (SJHP) rounds from Fiocchi are an excellent addition to the diet of your favorite .44 Magnum handgun or carbine! 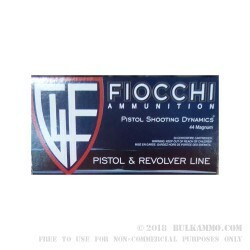 Fiocchi, an Italian company, makes the majority of U.S. sold ammo at their Missouri plant. The 200-grain SJHP projectile makes this load appropriate for home defense as well as hunting backup duty! Upon impact, the bullet is designed to begin expansion which causes it to yaw, turn, and slow before it over penetrates. In effect, momentum is appropriately delivered to vital organs and is more likely to drop a threat. Each bullet is secured within a reloadable brass casing that has a non-corrosive Boxer primer installed at its base and clean-burning powder inside its cavity. The projectile's crimp point features a ribbed cannelure which not only preserves accuracy under recoil but locks the bullet's copper jacket to its lead core. This effort prevents shedding or separation which could cause shallow, ineffective wounds on threats or game animals.